A recent issue of the Economist has a piece predicting a peak in oil demand. Until recently all the noise has been around the theory of peak oil production. Much ink has been put on paper on this topic and it even has variants. The version that I subscribe to is not peak oil in the sense of declining resources, but rather peak ability to produce. While this may seem like hair splitting, the difference lies in what is available versus what is economically available. Necessarily, therefore, these numbers depend heavily on a forecast of price. The higher this is, the more viable certain resources. This is why the discussion of that other peak, that of demand, is crucial. If in fact that turns out to be the case, oil price may well remain at levels that are unprofitable for some resource bases such as the Arctic. 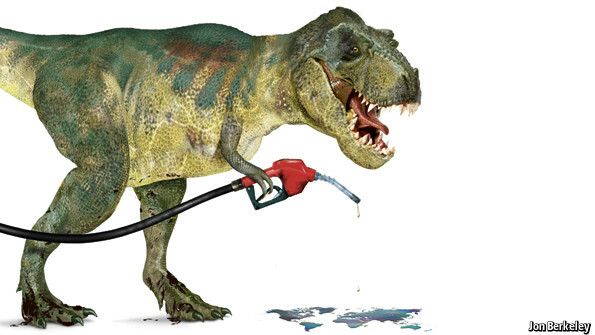 The Economist article even depicts oil as a dinosaur (reproduced above from the article). Lovely imagery notwithstanding, dinosaurs were wiped out by a cataclysmic event. Oil will be eroded away steadily and may never ever become extinct. In our previous discussion on peak oil, we referred to the phenomenon as a plateau not a peak. The two studies upon which we premised that blog, both came in with their plateaus in the low to mid nineties million barrels oil per day (bpd). The lower number, that of the French Petroleum Institute, IFP was 92 million bpd. Notably, and almost certainly coincidentally, the Economist citation of two studies is precisely that number, this time for demand. The Twin Peaks, as it were, if they were to materialize, would produce immense price stability. In the absence of a demand plateau we had theorized that a flattening of supply would lead to a continual rise in oil price. This was a partial basis for our belief that the oil/gas spread would remain large, at least in North America. Implications of a Demand Peak: Worldwide about 60% of oil usage is for transportation. That percentage is much higher in the US. But the point is that the non-transportation uses are probably the most vulnerable to substitution by natural gas. The largest two sectors are as a fuel (heating, electricity, other industrial processes) and in chemicals production. The degree of substitution will be driven by the spread in oil/gas price and the longevity of the same. Unlike in the past, the newer shale gas sources are abundant and forecasted to have predictably low prices for natural gas for decades. If this forecast holds it will cement the substitution and thus lower the peak oil demand. Easy to understand is the conclusion that the coincident peaks will put supply and demand in balance, thus stabilizing the price of oil. In that case the price of natural gas alone will determine the spread. Arguably all of the oil to gas substitution will put some upward pressure on natural gas price. LNG notwithstanding, gas is dominantly a regional, not world, commodity. The upward pressure will be less in North America, with shale gas resources that will unleash in response to demand. Eventually other countries will have that capability, notably China and Argentina. In the meantime higher local prices could slow some of the oil substitution. Will a peak in demand cause a reduction in the ability of the Saudis to manipulate oil prices? Probably not; if anything it could increase the urgency to prevent serious dips in price. The cost of their social programs dictates the need for stable high prices. But if reduced output is needed to prevent dips, this could have a net negative impact on their economy. But in an odd twist, the current move to switch from oil to other means for electricity production could come under review. If surplus oil were available due to export curtailment it could be burnt for power without a deleterious impact on revenues. In any case, diversification away from oil as the dominant source of income will be a key. We have in our columns here discussed the displacement of oil based products with natural gas sourced fuels and chemicals. Certainly the displacement of coal by gas in electricity production has been at a high rate, almost single handedly lowering CO2 emissions to 1994 levels. But this Economist article is the first I have seen that discusses energy efficiencies combined with substitution of oil to the point that demand plateaus. Dinosaurs are cool. But the accurate imagery is that of Luft and Korin, turning oil into salt. Vik: Why won’t fracking also be relevant in Europe and other parts of Asia and India????? Actually, shale gas will be relevant to the places you mention; there is no geological reason for that not to be the case. However, I simply expect more rapid action in China and Argentina, and those two happen to be in the top 3 for this resource. In Europe the most action is likely to be in the UK; Poland has had some early disappointments that could slow them down. You are currently reading TWIN PEAKS at Research Triangle Energy Consortium.